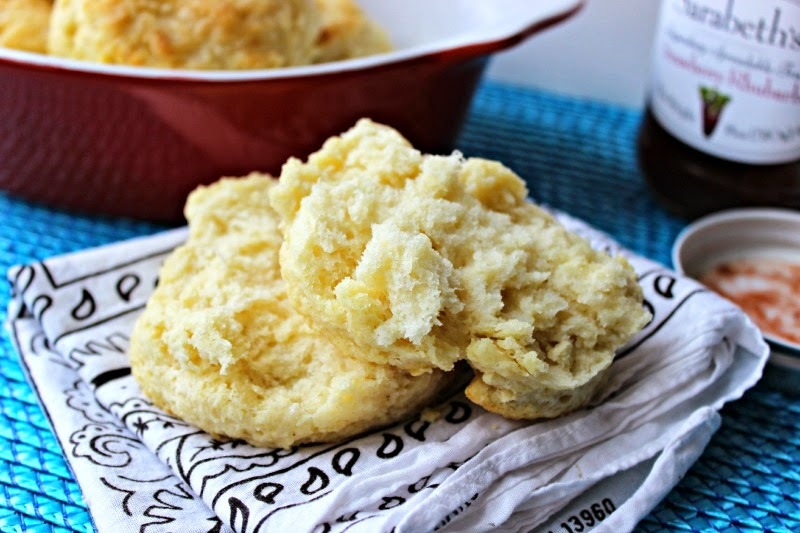 Hands down one of the easiest, tastiest buttermilk biscuits you can make from scratch. Since I discovered this recipe several months ago, I have made it more times than I have fingers on my hands to count. They come out wonderful EVERY SINGLE time. Even if you think you can't make tasty flaky buttermilk biscuits, this recipe will prove you wrong. They are a great addition to a big Sunday breakfast or a nice accompaniment to a warm soup or stew on a cold winter's night! I like to make mine big and use a 3 1/2" round cookie cutter allowing the recipe to yield around 8 - 9 big fluffy buttermilk biscuits. I start off by using a food processor to cut the cold butter into the flour mixture. (This is a real time saver) Then I transfer the mixture to a large bowl and barely mix in the buttermilk. From there the dough is transferred to a lightly floured board, where it is kneaded gently to incorporate all buttermilk into the flour. I use my hand to press the dough into a circle about 1/2" thick and cut out the rounds, then gather up the scraps and repeat until all the dough is used up. I will share with you one very important tip when cutting out the rounds...only press straight down when cutting out the biscuits. Never wiggle the cutter into the dough like you do with some cut out cookies. The wiggling will not allow your biscuits to rise to their full potential. Of course, make sure your baking powder isn't expired either and the buttermilk and butter are COLD! 1. Preheat oven to 425 degrees F. Spray baking sheet with cooking spray. 2. In food processor, with blade attached, add in flour, sugar, baking powder, baking soda and salt. Pulse a few times to combine. Add in cold, cubes of butter. Pulse a few times until the butter is pea sized in the flour. ( You could do this step by hand and use a pastry blender or forks if you don't have a food processor, but using the food processor really saves a lot of time and effort) Dump the mixture into a large bowl. Add in the cold buttermilk. Stir with spoon until just combined. Dump that mixture onto a lightly floured board and with hands knead a few time to finish incorporating the buttermilk into the flour. Press down with hands to form a 1/2" round. 3. With floured 3 1/2" in round cutter, cut straight down to make a biscuits. Gather up scraps and repeat until all dough is used up. 4. Brush the tops of the biscuits with a little milk. Bake for 12 - 15 minutes or until golden brown. Serve warm. These biscuits are delicious and you will need to stick to eating only one if you don't want to indulge. But they are a really great addition to a nice warm low calorie soup for dinner and they are incredibly easy to make in almost no time with very few ingredients. 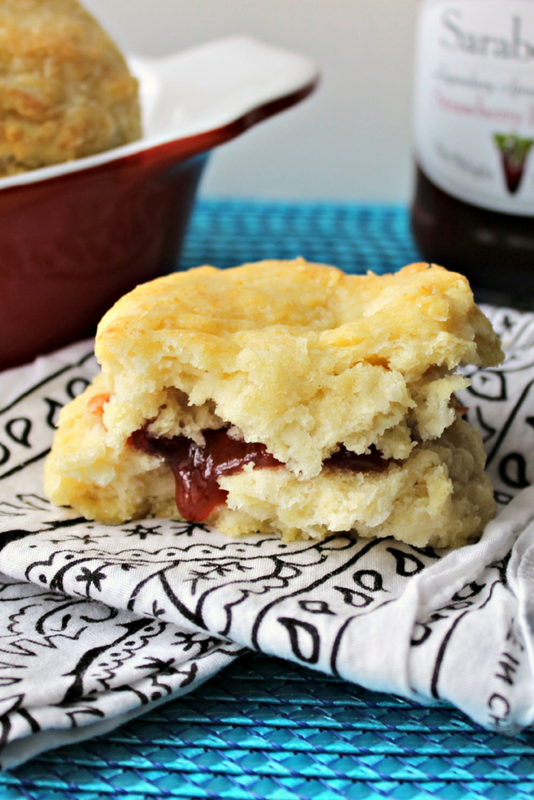 I will bet once you make these, they will become your "go to" biscuit recipe just like it has become for me! Christmas was nice and pretty uneventful this year for me. We enjoyed family time and the snow arrived just in time for Christmas eve and day making for a very picturesque scene. I would be fine with a green Christmas every year, but even I will admit it is pretty to look at. Of course all the fattening and indulgent foods were had...macaroni and cheese, pierogies, ham, beef, potatoes, and desserts! Plenty of desserts! I will be glad to get back to more "normal" for me eating! These sound not only easy but, so delicious!! I agree with you nothing beats a warm, buttery biscuit...total comfort food. I'm not usually a baker but, this sounds easy enough for me and I would love homemade biscuits for biscuits and gravy...another comfort food I love! :) Hope your Christmas was great and Happy New Year too!! give them a go Suzie...I think you will have much success! Happy New Year to you too! This recipe looks fabulous! I can't wait to give it a try. Hope you have a great New Years! Yum - oh Renee those look so wonderful. I love using the food processor to cut in the butter - so much easier and I like easy. I haven't made a lot of homemade biscuits but Grandmother made them so well - with shortening of course. A white Christmas sure is pretty. I hear you about the rich food and the sweets. It's time to detox! Hi Renee, I love biscuits and always on the lookout for 'the best' recipe. I love how flaky these look and definitely sounds like an "EASY" recipe which I love. Definitely will be making these. thanks for stopping by Joanne!! I hope you have success with these. I looked for a long time before I found this one and haven't made another since! 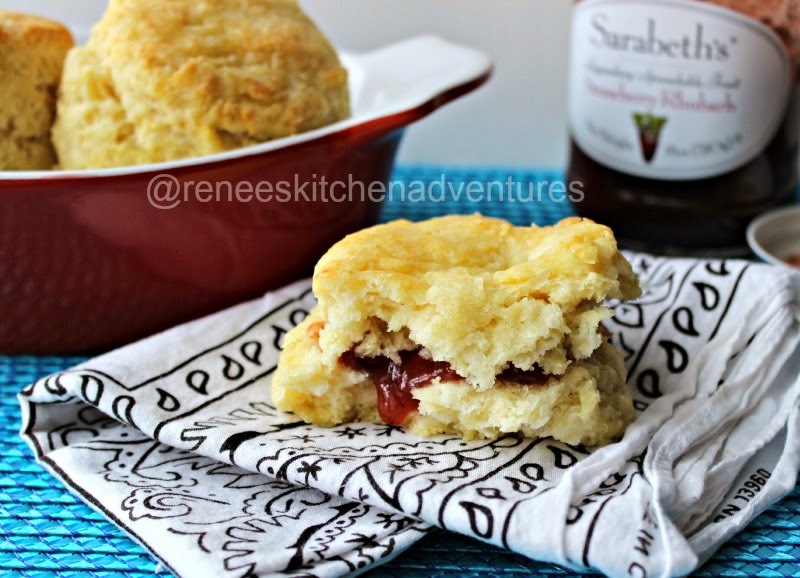 i love biscuits and jam! I dont use a rolling pin either. I just press the dough down with my hand and use the cutters to cut rounds. I hope you like this recipe!